The walk through Smuggler’s Cove Provincial Park might be one of the best and most scenic nature walks we know of. Look for the signs to Smuggler’s Cove along the Sunshine Coast Highway. Turn down Brooks Road and follow about 4K to a small parking lot. The easy forest trail meanders for about 20 minutes under a thick canopy, and through some amazing wetland habitat. If you don’t see the beavers, you’ll at least see their handiwork, which is quite amazing. The trail emerges at Smuggler’s Cove where your footwork becomes a little trickier as you navigate the rocky shoreline and around gnarly Arbutus trees. 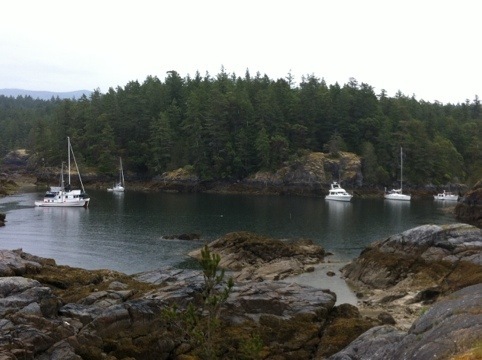 The scene repeatedly changes from tiny coves, to more expansive views of Welcome Passage and the Strait, as well as the larger cove which might be filled with boats of all shapes and sizes. 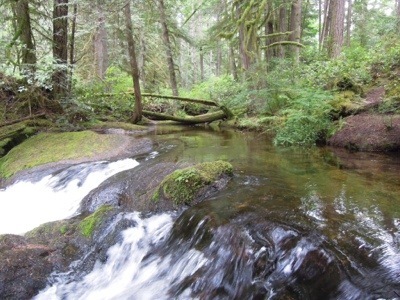 Homesite Creek Falls is a popular local gem. Nothing Niagra Falls about this place. Just a beautiful little creek tumbling over some hunks of rock through a gorgeous rainforest. A quiet little walk just off the sunshine coast highway. Parking is just off Highway 101 about 1K north of Brooks Road; or go down Brooks Road about 1K to an alternate parking area and trail head. This 45 acre park is managed by the regional district. There is a nice network of trails, which connect to other trails in the area. Ok. This one is a little ways away from Secret Cove, but it one of our favorites. Take a short walk through some amazingly intact forest of towering trees and meet the sea at Middle Bay. 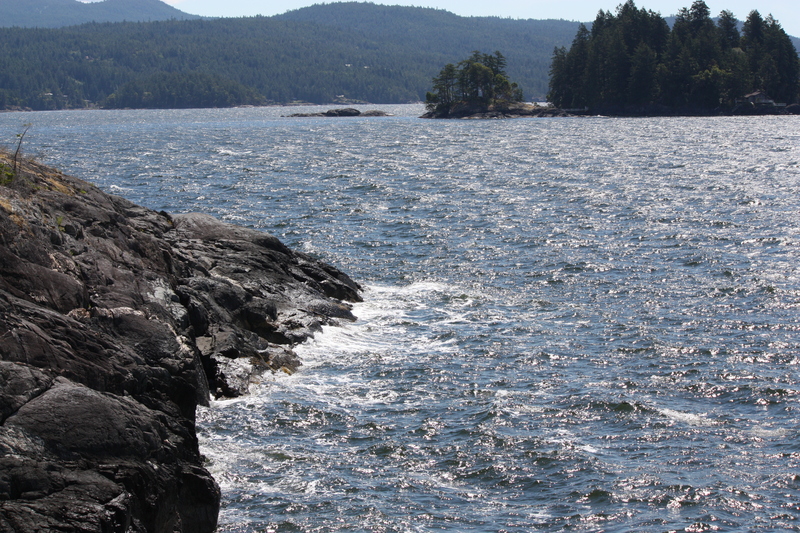 Take a quick left and after a quick walk through the forest you emerge on open rocky shoreline with a huge vista of the Salish Sea. From Smuggler’s Cove go north on the Sunsine Coast Highway. Take Francis Pensinsula Road (accross from Rona) till you reach Merrill Road and then the entrance to the park. Check the tide tables on line relevant to Skookumchuck Narrows. That way you’ll see the Narrows when water volume is at its peak. Leave Secret Cove about 2 hours before peak time (allowing a generous hour to drive, and a generous hour to walk in). Travel North on Highway 101 to the metropolis of Egmont. Skookumchuck Narrows forms the entrance to Sechelt Inlet. 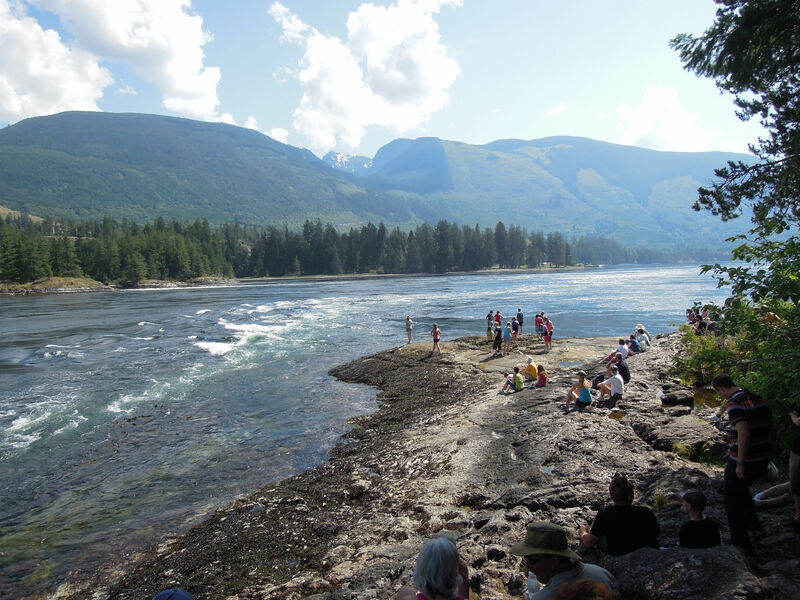 All of the tidal flow must pass through these Sechelt Rapids. At peak flows, whitecaps and whirlpools form at the rapids even in calm weather. 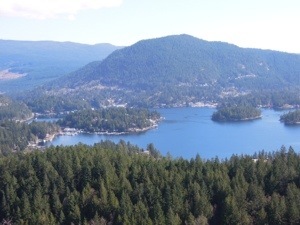 The narrows are also the site of a Skookumchuk Narrows Provincial Park. 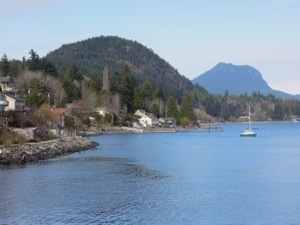 As the ferry approaches the Langdale you can’t help but notice a small but very prominent hill about a kilometer to the west, on the way to Gibsons Landing. The top of the hill seems almost completely spherical. Access is off Chamberlin Road, and there are two clearly marked trail heads it’s a 30 to 60 minute hike to the summit, depending upon your stops to take in the cliff edge views. It would be nice to suggest taking a bottle of wine up for the sunset – but the footwork is a little unforgiving on the way down, as are some of the cliff edges. The short hike up Pender Hill affords one of the most dramatic vistas on the coast. The nooks and crannies and tiny bays of the Francis Peninsula and Pender Harbour make for a picture of infinite interest. The trail up is about 20 to 30 minutes, and it’s all about the view from the top. 5km north of Madeira Park (at the PetroCan) turn left (west) off the 101 onto Garden Bay Road. After 4.5 km keep right on Irvine’s Landing Road. Go about 2km and turn right on Lee Road. Go a out 1km and look for the sign.